100% Whey Gold Standard from Optimum Nutrition has been elected best protein by athletes every year consecutively since 2005, making it the Gold Standard of whey proteins. Whey Gold ON is made from whey which gives the highest biological value protein and the highest absorption capacity. Whey from Optimum contains a high content of essential amino acids and BCAA's which are necessary for increasing lean muscle mass. Whey Gold is the right supplement to obtain the necessary protein to gain muscle and muscle definition. 100% Whey Protein contains small concentrations of fat and a high level of protein purity. Recent scientific studies indicate that 100% Whey Protein is the best protein supplement for athletes, especially for bodybuilders, who need superior quantity and quality proteins. 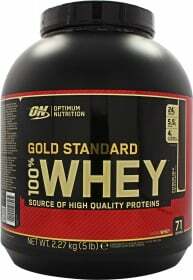 Optimum Whey Gold helps in building muscle, the formation of enzymes, antibodies, hormones and organic maintenance. Whey Gold ON contains a higher biological value (BV), with an excellent balance of amino acids. Just so you can have an idea, the BV of 100% Whey Protein is 159, whereas the BV of albumin (egg whites) is 88, chicken breast is 79 while casein is 71. In addition, as with all other crude protein, casein digestion begins in the stomach. But 100% Whey Protein eliminates this step. According to a study published by the American Journal of Clinical Nutrition, Whey Protein arrives as an intact protein structure in the small intestine where it's absorbed quickly. The best price for the protein of choice! Recommend! 10 out of 10 found this information useful. 2 out of 3 found this information useful. ... Without a doubt the best market, easy dilution protein, very good taste and even better results. “100% Whey Gold Standard 1 dose (sachet)” is currently out of stock. Enter your details below and we will let you know when it's back in stock. “100% Whey Gold Standard 176g” is currently out of stock. Enter your details below and we will let you know when it's back in stock. “100% Whey Gold Standard 24*30g (sachets)” is currently out of stock. Enter your details below and we will let you know when it's back in stock. ALLERGEN INFORMATION: Contains Milk and Soy (Lecithin) ingredients,May contain traces of nuts, peanuts, eggs and gluten. SPOON STIRRED: Gold Standard 100% Whey is INSTANTIZED. That means if you forgot your shaker cup or do not have time to get out the blender, you can just add one rounded scoop of Gold Standard 100% Whey to a glass filled with 177-237 ml (6-8 oz.) of water or your favorite beverage. Then mix it up with a spoon. Stir for about 20 seconds or until powder is completely dissolved. TIP: Adjust the intensity by varying the amount of liquid that you use to prepare it. For a bolder flavor with slightly more body and sweetness, mix each scoop with 118-177ml (4-6 oz.) of water, milk, or your favorite beverage. For a milder tasting, less sweet shake, use 237-296ml (8-10 oz.) of liquid per scoop. SHAKER: Bringing a shaker cup with you to the gym is the best way to get a powerful dose of protein immediately after your workout. Just pour in 177-237ml (6-8 oz.) of your preferred beverage and then add one rounded scoop of Gold Standard 100% Whey to your shaker cup. Cover and shake for 25-30 seconds. BLENDER: Add one rounded scoop of Gold Standard 100% Whey to a blender filled with 177-237ml (6-8 oz.) of water, nonfat milk, or your favorite beverage. Blend for 20-30 seconds. Then add 1 or 2 ice cubes and blend for an additional 30 seconds. SHAKE UP YOUR SHAKE: By adding fresh or frozen fruits, peanut butter, flaxseed oil, coconut and other high-energy ingredients, you can transform your shake into a delicious high-protein meal. STACK YOUR SHAKE: You can make Gold Standard 100% Whey an even more powerful recovery product by adding supplements like creatine, glutamine, BCAA, and concentrated carbohydrate powders. SUGGESTED USE: Consume approximately 1 gram of protein per pound of body weight per day through a combination of high protein foods and protein supplements. For even best results, consume your daily protein allotment over several small meals spread evenly throughout the day. WARNINGS 100% Whey Gold Standard : This product contains whey derived from dairy and lecithin (to improve mixability) derived from soybeans. For use as a dietary supplement only. Do not use for weight reduction. Keep out of reach of children. Store in a cool, dry place.